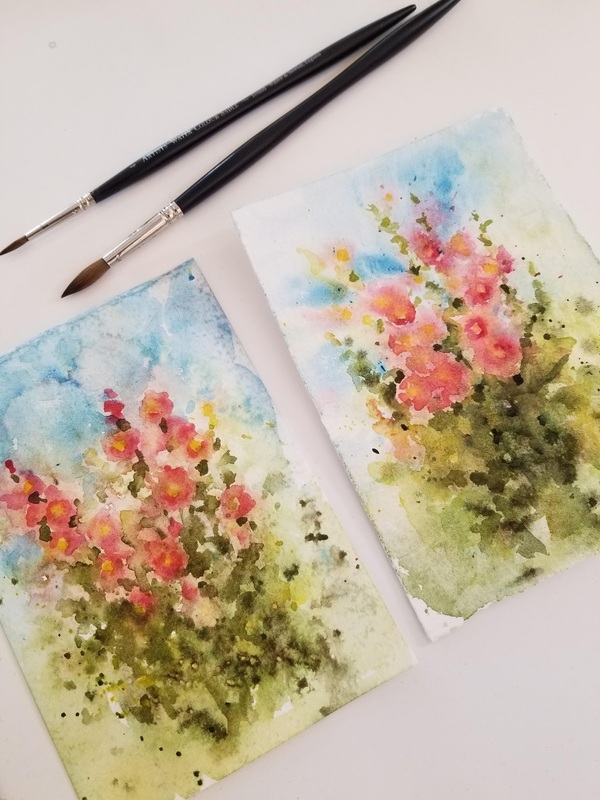 Inspired by nature, at home in Montana, I translate those landscapes and wildflowers onto paper with watercolors and brushes. 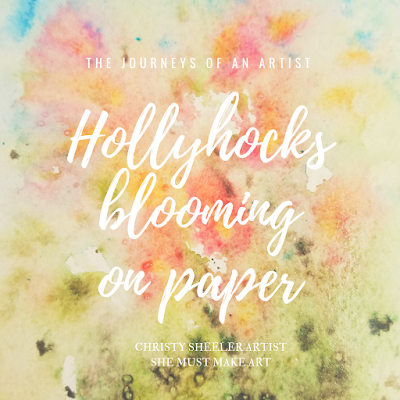 I've got an attraction to hollyhocks and it started quite a while ago. Years ago...before I was a mom...I painted with a group of artists. It seems like another lifetime, really. On one of our artist get-togethers, we met at Pat's place. With art supplies and lawn chairs, we scouted out our subject for the day. We sat out in the sun, sketching and painting while we visited together. 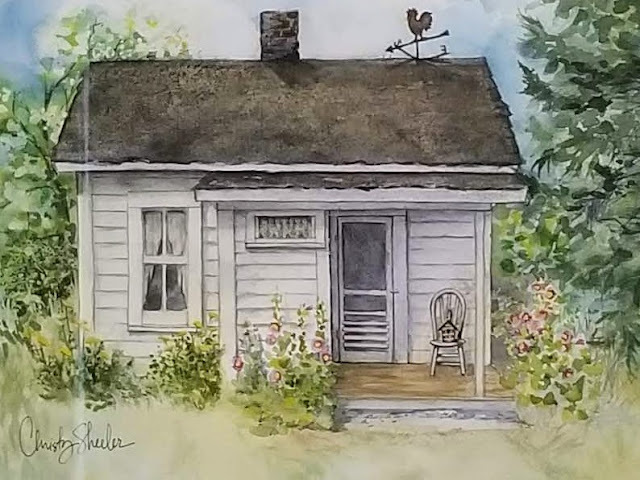 The subject was an old house on the property...with hollyhocks in the front garden. 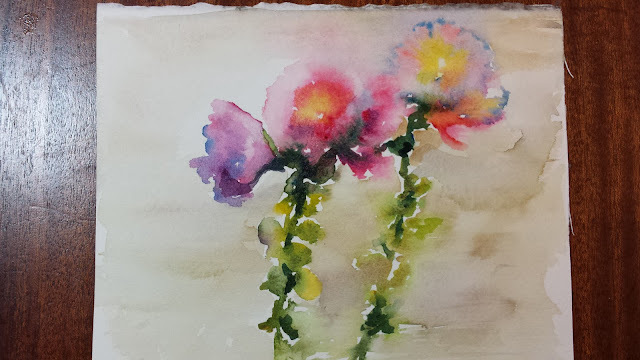 Unexpectedly, I found delight in painting the hollyhocks. They weren't detailed but more of a suggestion, their form and creating them was so fluid. They were more effortless than I imagined they could be. This was a nice change from my need to be so detailed and exact. Turns out, this has been a theme in my creative time...letting go of exact. Reflecting on days spent with artist friends. This very painting now hangs in my art studio and it's dear to me. A little house with so much charm that's been maintained and cared for...like a little bit of quaint beauty that takes the viewer back to a different time. There was so much about it that I loved, which is how I hope it is described it on paper. A lovely day with artist friends, captured here, has a lot of sentiment attached. Do you see the hollyhocks all loose and fresh as they welcome you onto the front porch? I was just walking along, minding my own business. Fast forward quite a number of years to summer of 2015. I was walking down our alley and there are reseeded hollyhocks in all shades of pink. They just grow untended along the backside of a storage shed. I remember how the view affected me. The tall stalks and blossoms against the weathered wood out building with full sun. I quickly retraced my steps back home to grab a camera because this was perfect art reference material! Undeniably, I am an artist. It's a crazy process. 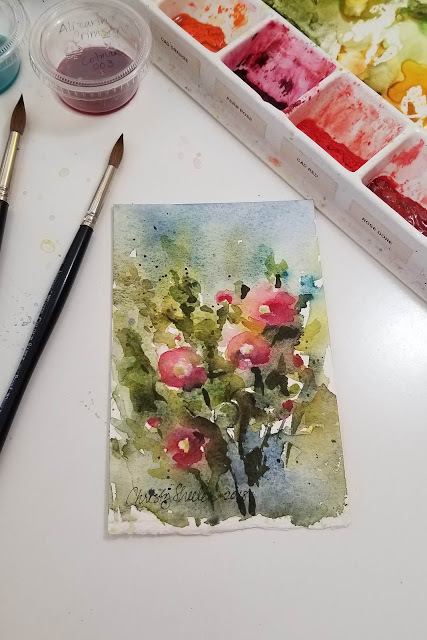 I have been able to find more time and energy for my love of watercolor. The art studio is no longer an abandoned place without life. 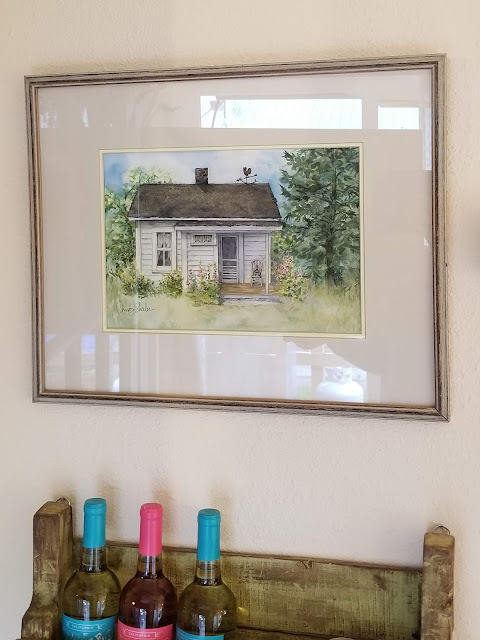 My life, in my mind, is described in seasons tied together with whether I was able to spend time with watercolor painting. Does that sound crazy? I was created with this deep desire to create and watercolors just hit the target like no other medium. When I must place it further down on my priorities list, I feel it deeply. I have been all over the place with several different subjects. Hollyhocks, a black beach on Maui, and several mountain landscape views. 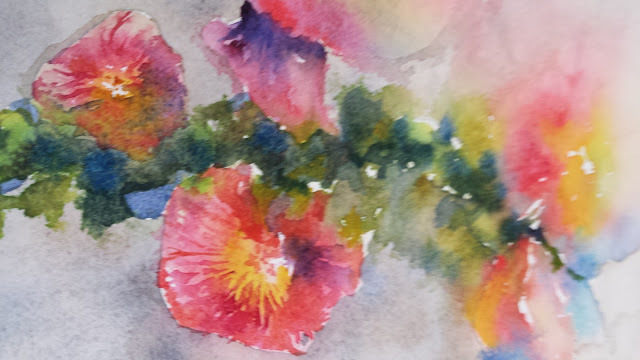 The hollyhocks keep drawing me back to study them, capture them with paint one more time. There's been joy mixed with frustration. In certain moments, I was tempted to toss the current one aside and call it unsalvageable. Sometimes, I would rather start again than keep making more effort on the same painting. It's hard to say which is the wiser option. I've learned that it's worth pushing through and seeing what another hour's effort will do. Undeniably, I am an artist. It's a crazy process. I am trying to communicate through my brush what my mind wants to communicate. In a frustrated state, I'll state out loud to no one in particular, "I guess that flower does NOT want to be in this painting?!" And I regroup. I rethink where I would like to go with this effort. It happens. It happens often. With time I have gotten over thinking this isn't supposed to happen. I can shrug it off and start again more flexibly than my younger self would have done. Sometimes I'm just loving where the brushstrokes are moving and mixing on the paper. Other times, I'm wondering what just happened and how should I move forward next. Artists may work in a way that appears to be easy. From an onlooker's point of view, the artist may seem to do it so well that we suppose they never struggle in the process. That's just not true. If it were, we'd probably find the art process very boring. I don't think the level of skill matters...artists will continue to strive for improvement in their skill. Artists want to develop and grow and capture more. Artists have an intense need to communicate what captivates them better than they did in the past. 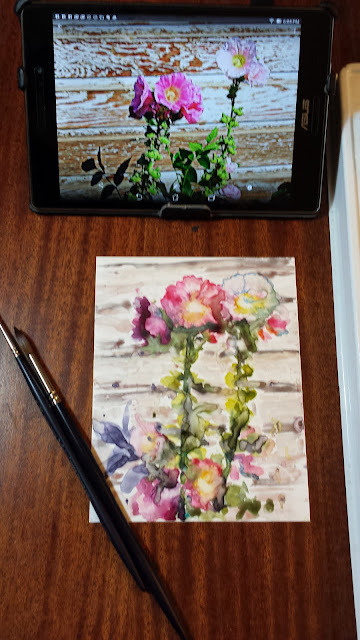 I've been working on Yupo synthetic surface and watercolor paper both. I'll share my results with you. There are pockets of joy in the results. There are areas of struggle. Petals and shadows that I didn't fully capture to my satisfaction. I didn't describe it all in the way it affected me. I'm growing in my ability to change up the composition and the forms. These next artworks show something changing...I am not sketching at all. I am letting myself have freedom from being so married to the art reference photo. 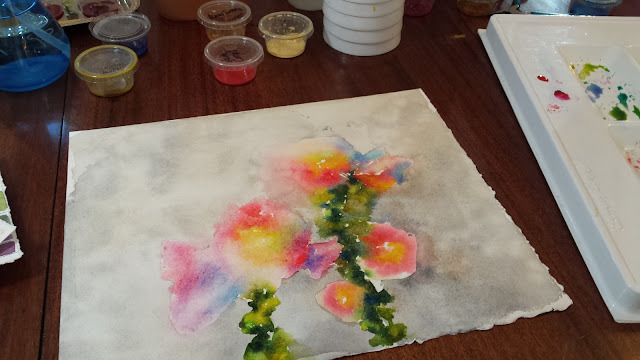 Get the music playing, spray down the palette and then I explore the emotion these flowers draw out. Their shape, the space they fill, the colors created by sunlight and shadow. What is a pink blossom in the sunlight? What is it in the areas of shadow? What type of yellow green captures the leaves and stalks? Add some water for a bloom and then some spatter of color. The learning comes in the doing. If you are itching to pick up a brush and have a go with the watercolors, do it. Go. Don't hesitate. You'll find a joy in the movement of pigment across the paper. There are so many opportunities for learning now. Order a book. Watch a YouTube video. You will fight fear and hesitation. The learning comes in the doing. The doing brings a peace and relaxation. It's a therapy. You will grow and understand it a bit at a time. You'll never master it. That's okay. You'll be excited and challenged and alive. What subject or art medium has hooked you so strongly? What have you felt you must try creating one more time? What do you desire to capture on paper, on canvas, or in clay? Hello! I'm Christy. I'm inspired by nature to create watercolor artwork of Montana landscapes. It's an adventure that will never end. With a full life of other responsibilities, I still make time to be an artist. Everyday, there's a sunrise or a sunset, a beautiful sweeping of clouds across the sky, a frost on the trees or birds perched at the feeders. I find beauty in it all. I take that inspiration and move to my art table so I can find a way to translate it onto paper. 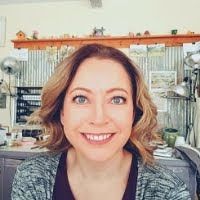 This blog is where I tell about my journeys as an artist. These are my adventures in growing as an artist. My artwork is available for purchase. Please email me for more information. 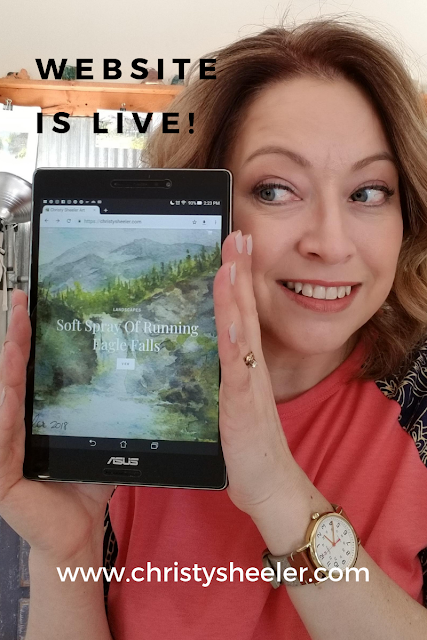 My Big News: My Website Has Launched! Change. What it really means. No Searching Needed: The Artist is Not Lost! Follow Christy's board My Creative Works on Pinterest.